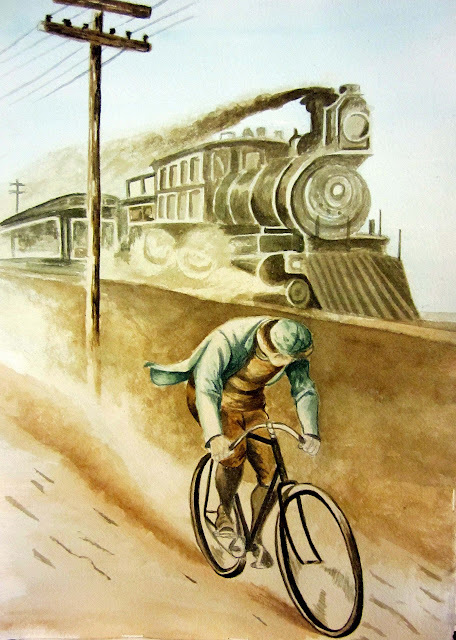 While surfing the net, I found this little picture of a cyclist racing a train. It turns out its an old Remington advertisement. I loved it so much I asked Meme to paint it for me. What I like most about this photo is the olde time bicycle, fixed gear, I presume, racing the train. It reminds me of Clark Kent (Superman) as a young boy racing the train while heading home from school. The picture epitomizes the pure joy and elation one gets while riding a bike. With the wind in the face and at top speed, riding is freedom.